Casual Cash Going On Now! Stop or call to learn more on how you can save BIG this summer. You work hard, it’s time for you to relax! At The Casual King, we have everything you need to create the ideal outdoor space that’s special to you and will last for years to come! With the name change The Casual King (Formerly Unfinished Business) there’s so much more to explore. Come visit our 10,000 sqft showroom. We carry a wide selection of Poly furniture, deep seating, Teak, Wicker Aluminum and more to suit every style and budget. In addition we carry any outdoor pergolas, sheds, garages, play sets, and any other outdoor structures and supplies you may need. Look no further than The Casual King for the best in outdoors. The Best Selection of poly furniture in New England! With our own Adirondack Everything Collection. We also carry teak, all weather wicker, aluminum, and ipe`, fire pits, umbrellas, cushions, pillows and accessories! Discover Adventure World Play sets - Finest on the Planet - Wood Encased in Vinyl with Poly lumber. No splinters, No maintenance - Also our Popular Eagle Wood Play sets. A Set for every Space and Budget ! Amish Direct from the Factory - Pergolas and Pavilions Sheds - Gazebos and Trash can Storage. Delivered by the same Professional Team servicing our customers for over 20 years. We Solutions for every project! We represent the Top Suppliers and the Most Popular Products in the Industry. Our Outdoor Display and 10,000 Sq. Ft Indoor Showroom give you lots to look at. Stop by and spend a little time. Our team of highly trained professionals will deliver, take care and set up your furniture whether you’re home or away. Relax, we’ve got this! Our prices can’t be beat. 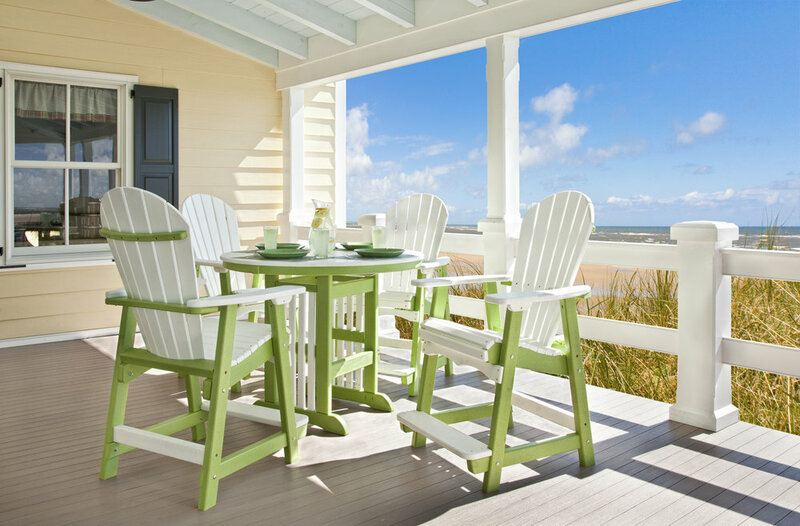 We take pride in our selection of highly competitive and affordable selections of outdoor furniture. We beat many of our online competitors, let us show you! Check us out on Instagram at @thecasualking528 ! “Fantastic! We were looking for recycled plastic furniture and were amazed at the amount of it on display. Hands down the best prices we had seen anywhere. Saved a bundle from what we almost bought elsewhere.